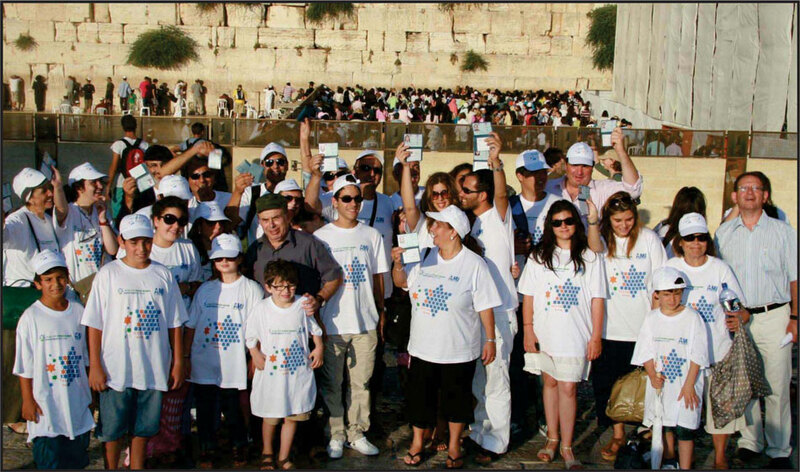 Former Director of the Jewish Agency, Nathan Sharansky (center, in dark shirt) welcomes a recently arrived group of Jewish French Olim (�New Immigrants�) showing their new ID�s at the Wailing Wall in Jerusalem. "The French Jews, most of them rooted in North Africa, are very pro-Israeli Jewry. Israel is their love. It exists inside their heart and soul. Politically, they have moved to the Israeli right. They love the Israeli government. Since the 1967 Six Days War, they have become great lovers of Israel. We should increase its linkage to Israel. They will support a pro-Israeli French government. Israel is a great aspect of the French Jews� politics. They loved, for example, President Francois Mittrand, admirer of the old Bible people. Of course, many Israelis are active inside the French Jewish community. Some are representatives of various Israeli organizations," remarked Dr. Yehuda Lancry to me in our interview in New York. "Also, there are economic relations between them and Israel. They have bought many apartments and real estate in the cities of Ashdod or Netanya. They are tourists or Olim," added Dr. Lancry. He is an expert of the history and life of this Jewry. He has a PhD in French Literature. His family background is Morroco. Lancry contributed to Israel's power, well-being, and its positive image. Lancry, a modest celebrity, should serve again in the Israeli government and its agencies. Why? Lancry, a superb intellectual, was first a young mayor of a small city in the north, a target to the Arab enemies. Later, he was elected to the Knesset and served as a vice speaker. The next step in his political carrier was service as Israel's ambassador to France in Paris. There, he contributed to the improving of the Israeli-French relationship and he, also, increased the French Jewry�s love for Israel. Lancry's next step in diplomacy: Lancry was appointed as Israel's ambassador (permanent representative) to the United Nations (1999-2003). He expressed unique courage when he fought for Israel's interests and prestige leaving a heritage behind him. Lancry also has experience of activity in the media (Director of Ch. 2), and today, he is active in establishing a new 'French CNN'. And Benjamin Netanyahu is backing this project. (A pro-Israeli media channel). There are, today, 600,000 Jews in France. In many cities and in Paris, there are Jewish communities. The Jewish population, today, is around 10% of 65 million French people. Dr. Lancry explained that around 200,000 Jews made aliyah, immigrated to Israel! Their family roots are from North Africa. They link to great history of Judaism and unique heritage. "Today, they are integrated into the French Society. First, they are young (40-50 age). Many of them are doctors, professors, and other professionals. Many also served or work in the government or parliament. Some are very famous: Leon Blum, Mendes Frans, and others. Jews, generally speaking, have not suffered form discrimination," remarked Lancry. What is the future existence of the French Jewry? Do we have to challenge negative processes inside this Jewry? "The answer is yes. Why? There is a negative process of assimilation like the one in the United States. The rate if 4 to 5 our of 10. This process means a strong assimilation inside the Jewish families. The challenge: There are still many Jewish schools, a strong religious leadership, many synagogues and a 'back to Judaism' movement. �Since 1945 there is organization with unites all of the Jewish communities in France. Its goal is to defend Jewish rights and fight against anti-Semitism. It is sad that only 300 families our of 1,000 (1/3) are members of any Jewish organization," said Lancry. Anti-Semitism in France? "The Muslim minority, 10% of the total population, a new French probe is to blame for the modern growing of anti-Semitism. Many of them are extremists and pro-Arab or pro-Palestinian. But they do not have French allies. Muslims are the new anti-Semites and anti-Israelis. �Recently, France was shocked by the murder of two Jewish adults and two children in a Jewish center. The French Jewish lobby has pushed the government to act and defend Jews and Jewish synagogues and centers. Generally speaking, my conclusion is that anti-Semitism in France is a marginal issue," explained Lancry. How do you define the state of the Israeli-France relationship? "There were situations of ups and downs from 1956 to 1967. It was excellent, without precedent. But later, President DeGaulle changed this love affair. President Holander, a socialist, voted in the UN for the Palestinian Authority but he is not an anti-Semite or anti-Israeli. France, of course, wanted to have good relations with the Muslim and Arab world. Bt the French Jews objected to this policy and demonstrated against it, against their government," said Lancry. As to the French vote in the UN's general assembly, Lancry, Israel, a former ambassador to the U.N., illuminated the following: "It is an historical fact that Israel does not like the U.N. We must understand that there are blocks of countries over there. Muslims and Arabs have a block of 58 states out of a total of 193. I joined, as Israel's ambassador, the Western Block. The ambassador, today, Ron Prosor, a great diplomat, managed to get support of African states. I tried to establish a new policy in the U.N. Why? We always were on the defensive status. It is hard to change this. Once I, without a call from Jerusalem, managed to push Iran into a defensive position," said Dr. Lancry.